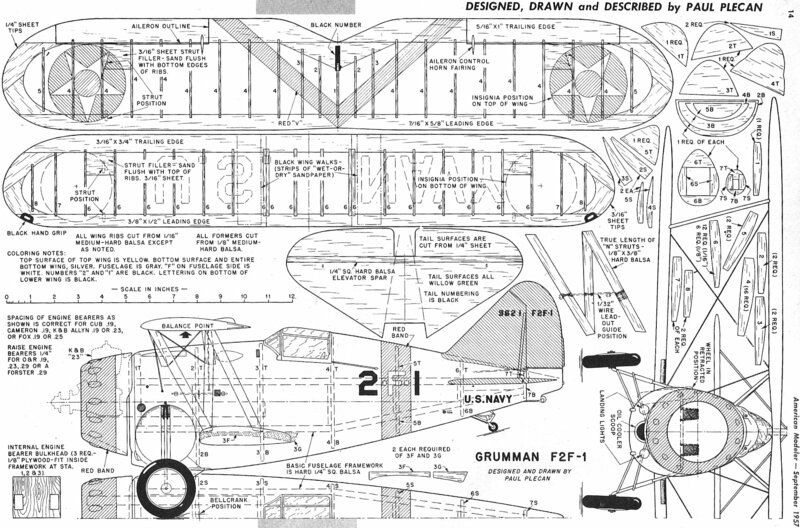 Click on the plans at the bottom for a larger version. You might be able to buy full-size plans from the AMA plans service. All copyrights (if any) are hereby acknowledged. Easiest way to get going is to build the wings first. After cutting out the required number of ribs and tip pieces, cut leading and trailing edges to size. Note that ribs are notched into both leading and trailing edges. Once all the cutting is done, cement together over the plan. The lower wing incorporates some dihedral, so crack the leading and trailing edges (after cutting partly through) where the doubled number 6 ribs occur. Propping up tips with scrap ⅜" stock: under # 1 ribs produces the correct dihedral angle, so just let the cement dry well while we tackle the fuselage. A basic framework is built up of ¼" square balsa longeron, followed by the various former segments as shown in the step-by-step sketches. The suffix on each former part clarifies its position; T for top, S for side, and B for bottom. Along about now it will be necessary to cut out 2 each of parts 3F and 3G. Thickness is immaterial, but 3/16" or ¼" stock would be fine. Former 3B is cut off flush with lower edge of 3F -3G so that top surface of center section of lower wing" fits snugly against this assembly. Lower wing should be covered and doped now so it can be assembled to the fuselage framework. Silk is recommended "for maximum strength and resiliency. In assembling the lower wing to fuselage, be careful to keep alignment right on the button when viewed from above (they should be at right angles). The part remaining of 3B is now trimmed an amount equal to thickness of wing at that point and cemented to bottom of wing. We can now proceed with planking of fuselage. Use soft ⅛" x ⅜" balsa strips, starting near top longerons and about parallel to them. Due to the pronounced taper of the fuselage from station 3 to the tail at 7, it will be necessary to taper the planking. This is easiest if you have a really sharp miniature plane, but if not, a metal-edged rule laid across edge of planking strip will guide your X-acto knife or razor blade for a straight taper cut where you want it. Sanding wm achieve the slight bevel necessary between adjacent strips; the finished fuselage should be practically devoid of slits or gaps in the planking. More sanding is in order now to achieve a smooth surface. Section forward of fanner 2B is carved from a block of balsa, 2¾" long by 1⅝" deep and 3¾" wide. If you so desire, the wheel-wells can be carved into the sides of the block; however, many will choose merely to paint a 2½" circle in dark gray or black on the sides of the fuselage in the same spot and let it go at that. For maximum strength, it is best to lace the main landing gear strut to the inside structure as shown on plans. Strong sewing thread or upholsterer's thread is fine for this, plus generosity with cement. A plywood insert between engine bearers (or on top) is necessary for bellcrank attachment. Laterally or vertically the position is not too important, but do not change from longitudinal position shown; 1/32" aft of station 2 is ideal, as shown. The line guide for the lead-outs on the "N" strut is positioned for bellcrank position shown, so change it if you change the bellcrank position for any reason. Tail surfaces are cut from ¼" sheet and sanded to section shown in side view. Regular fabric hinges are used (or whatever type is your favorite) and be sure ample movement of the elevators exists. If a small Veco (2") bellcrank is used and the elevator horn is about the size shown, up and down travel will be sufficient. An important item of appearance will be the wheels. The narrow-tread tires and wheels used on these older-type jobs make wheel procurement a problem. The right-type wheels can be obtained. from Scalemaster Models, 28 Ionia, Grand Rapids, Mich. $1 per pair, postpaid. 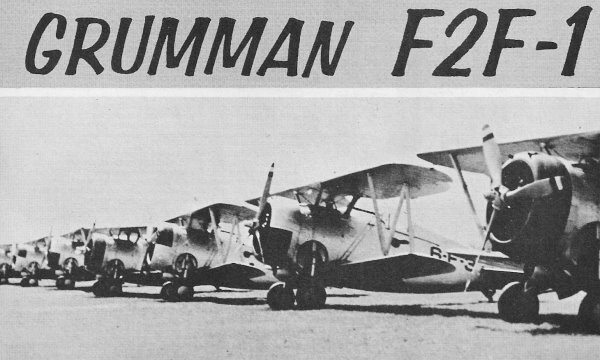 If you are making primarily a :flying model, simplify the tail wheel mounting into a single wire deal. Complicated stuff just doesn't hold up for wear and tear of flying. 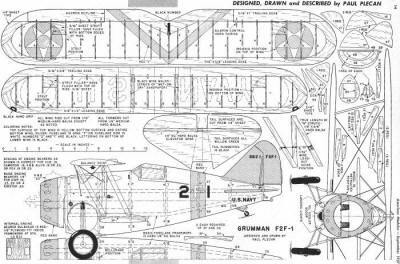 For those who may have trouble in getting top wing in place correctly on a biplane, here is our advice. Cut a "jig" out of any thickness wood handy. This should have the contour of the wing I undercamber for its top edge and the I shape of the fuselage profile for its lower' edge (that portion of the fuselage directly under the wing). Now if this jig is pinned or taped to fuselage and then wing taped to it, you will have something to hold the wing in place while fitting the "N" struts. Brace the top wing to the bottom with scrap strips and check alignment from above and from front before fitting struts. 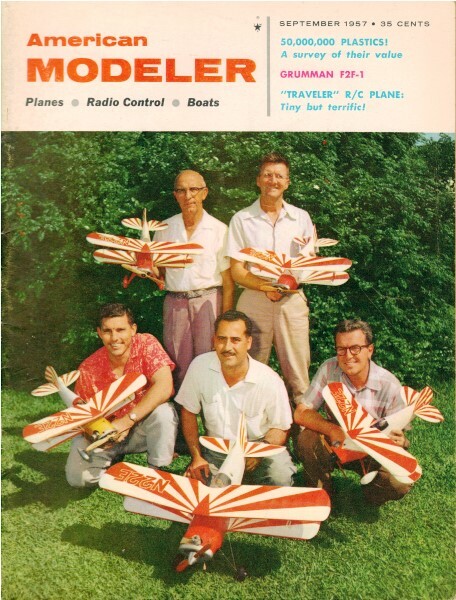 Try out my Scale Calculator for Model Airplane Plans.